This resources is outdated and unmaintained : it won't work with recent versions. First screenshot : A speedpainting done with picking from a lot of brush in the V3 kit. Second screenshot : an speed attempt to copy a pastel work from Degars to test the pastel row of the brush-kit in depht. Original art here. Details of the art painted for the icons, directly in the 'edit' panel of Mypaint. This work was done for fun and to look better for a large audience. Finally the colours ( inspired by the excellent Tango palette guideline ) and the funny painted tools are more efficient to fastly find a tool. In your ~/.mypaint/brushes/ again , open the 'order.conf' file with a basic text software ( gedit, kate or notepad ), and copy this at the end , and save. The distribution and the files are under the creative commons 3.0 attribution. If you want to know more about ; read the following page here. You are free to use those brushes files to draw / paint a commercial project without attributing me. You can show them in a screenshot of your workflow or in a video screencast freely without attributing me. You can show them in your school if you are a teacher or a student and do a presentation about on a CMYK ( paper / print ) support or a RVB ( video / internet / presentation / Tv ) without attributing me. If you are a developper of an open source software, you can use them in your code for your software without attributing me. mentioned at the end of the article, 13 june 2010 . Awesome work! excelent presentation of the kit. I have downloaded and i hope to test them as soon as arrive home.The thumbnails are great and the screenshots are lovable. good man, you have surprissed me again. I'm happy if you liked my work on the presentation of this brushkit. Cause this V3 is mainly about presentation and thumbnails : you will see I don't bring really 'new things' to the Mypaint brushes ability or from my V2 brushkit. A lot of brushes come from the 'classic' set already in mypaint 0.5, some from Tanda set , and one from Ico_Dy. ( the detail is in the brush name, as well as on the big info picture in this blog post ). I didn't picked brushes from your set cause I use them directly in your set, I like how the basic size of your brushkit are targeted to professionals with big sized brushes to work directly in zoom out to have resolution for printing. 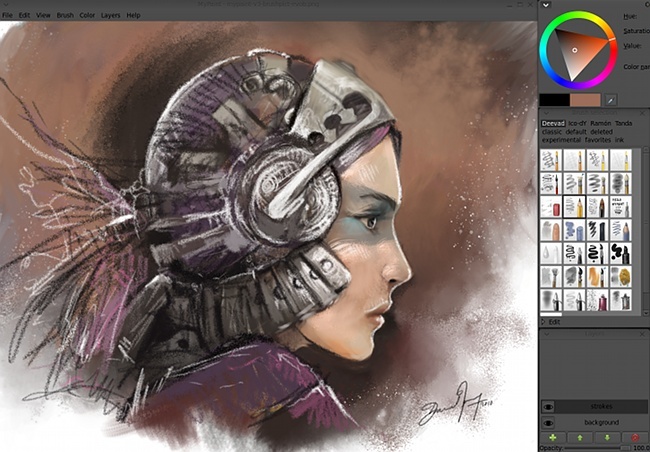 Revoy, that his work with Mypaint is fantastic. The icons are very clear and intuitive this time, making it much easier time to use the tools ,that are perfect, with very diverse functions meeting the basic needs of any artist. Congratulations! Hi david, first, congratulations for this work, i'm testing the brushes and all works very well, second, can i translate this page and share in my blog? linking this page of course. Excelete Brushkit! gracias por compartir tan útil herramienta. Felicidades por tan buen trabajo. @Jonathas ; translate is cool :) Thanks for the link. thanks for putting this up. I want this so bad on my program but I can't seem to get it right. When i open pain, I do see th V3 catergory beside Ico-dy and Classic, but nothing is underneath. I didn't see a order.conf, so I put it under the closest thing which was order. Please tell me what I did wrong. @Sabra : If you don't have at all the brush in Mypaint, it mean you didn't copy well the *.PNG and the *.MYB files in the ~/.mypaint/brushes/ folder. May be try again and try to follow the install step carefully. I hope it will help ; if not tell me what is your system, we surely can try something else. Thankyou so much for the quick response. I retried it about six times and I've got it working. Thankyou. And your artwork is crazy good. If your on youtube, I'll try to suscribe. Thanks again, you're awesome. Wow, these tools were wonderful. The miniatures are beautiful, they were easier to visualize and gain an artistic aspect. Install them on windows is a bit tricky because I needed to add the brushes Mypaint folder in Program Files. They appeared on the default option, not a specific window, but that does not interfere with anything in the experiment. Grateful for the work. @Rock Lee : Thanks :) and good trick to install them directly in the 'programs files' folder. Thanks you very much for the time an effort you spent to give us that brush-kit. It is really amazing and it matches so well with your digital painting DVD. 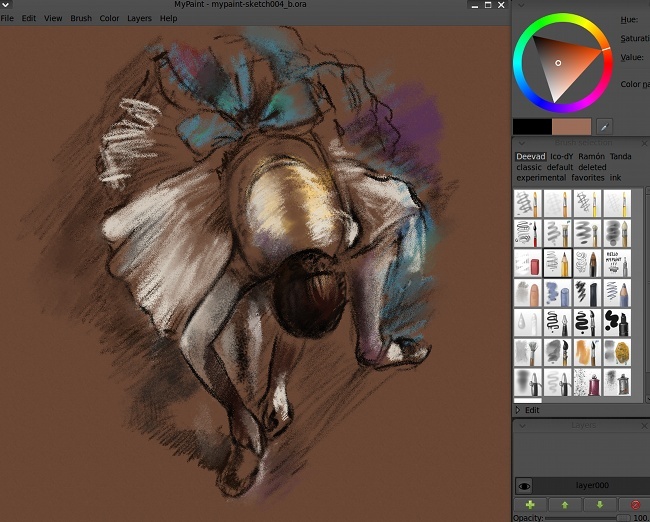 I think this brush-kit might be a crucial step to make Mypaint closer to Painter, in my concern. Wow, thanks. Put these on as soon as I found them. Excellent work great brush set, wonderful icons. Just go a Wacom tablet two weeks ago, so can't wait to break it in with these. PD: Do you have some tips for draw hands?? (If french-english is a pain-blend, imagine the spanish sun between the english clouds and you can see the disaster... :D... Well, i hpoe you can understand what I have written. Best regards... from your south neighbor... Gamby.. Very cool deevad! I love the presentation and the overall work you've put into this! The same are on the dvd? - Layer are in Mypaint ; ( in the menu > Layer ), and the best keystroke shortcut driven layer stack in my opinion. I use layer only with the keyboard. - This brush kit is not on Chaos & Evolutions , I made this brush kit after the Dvd. wow, thanks i was looking for brushes with icon reference fot mypait, just great! All the Dvd screenshots use the same dark Gnome theme, It's a customized theme I always use. Here are the settings if you want to have the same on your machine. * Under the theme panel click "Customize"
This is likely the most valuable thing you could have ever done for yourself, David. It takes me back to when I was a graphic designer for a year. I had lots of custom brushes for doing all sorts of things very specific to the tasks that I needed to do every day. Later, when I lost that job, they wiped the computer and thus I lost all my brush presets. There's something about my new collection of brushes that just doesn't come close to what I had. When you're doing it every day, the refinement isn't just in an order of magnitude by how many days you use them, but it compounds by how many days you used them in a row, and how frequently, and why. In a way, you sort of made up your own software here. Mypaint will become Davidpaint. And for that, I thank you. hello David, this is wonderful job thanks for all the brushes. Can you please tell me how to change the pencil setting so that it actually makes a 1-2mm stroke each time I make a dot (each time I press the pen or mouse). In that way I can stimulate the strokes of a sketch in pencil. @Wray Bowling : I laughted a lot for the 'Davidpaint' :) Thanks ! and thanks for sharing your story about brush kit; this reminded me the old time when I used Photoshop and only use a compilation of others brush kit. @MaxTux : Thanks for doing a blog post about it ! @Salkis : Sorry for the late reply ; ( my excuse is ... : 'Sintel' ) I think you should rise up the diameters of the brush and reduce the dynamic on the opacity. @Hayashi Nomura : Thanks for the brush + subscription :) Cool deviant art gallery ; I 'm jealous of your mastering of this romantic anime style :) Perfect for story telling about love; a cool 'drawing' tool. Keep good job ! your are absolutly out of your mind.it´s youre fault that i now own four programs to find out what my imagination is all about! i downloaded my paint,alchemy,gimp and my sister gave blender to me as a birthday gift last december. wonderfull!! !first picture i painted in (my paint only) was a tornadoscene,and i was just like wow as i looked at the result one hour later.the glow pencil gave realistik looking lightnings and so on.i´m totally amazed.i´ll definently keep your site in my eyes because you know:IT´s YOUR FAULT!! !greet´s n´best wishes from westwood,germany. Hi David, I really would like to try out these brushes, but I can't seem to get past the first step. When I downloaded from the link you put, it only shows 1 file in my downloaded files? I don't see a V3brushes folder?? I set the file to open with Microsoft Word by accident and I'm not sure how to fix it back. Or what app should I open the file with? So, I finally got it! : ) I'm not sure exactly what I did, but thank you. This is really helpful for me as a first-time user on a tablet. Much appreciation!! @amy : Oh cool you found it ! Sorry I was in a trip and couldn't reply.